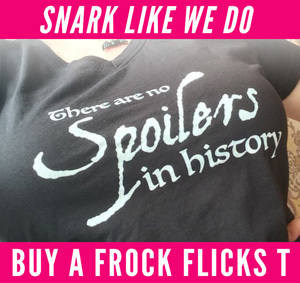 Frock Flicks note: This is a guest post by our friend Sabrina, a historical costume enthusiast who enjoys sewing historical costumes from various eras. She is currently working on her PhD in English literature. 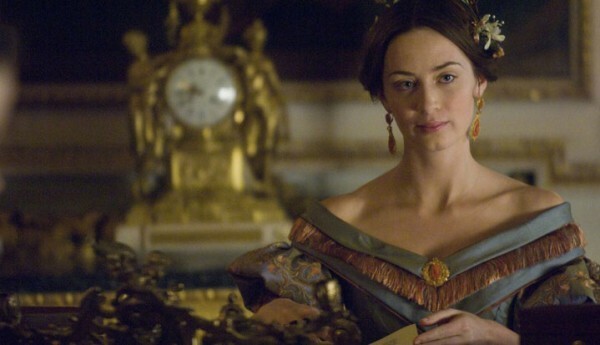 This is the second part of my review of The Young Victoria (2009). Part one looked at Victoria’s maturation as it is reflected in the costumes as well as the historical fashions that inspired Sandy Powell’s Oscar-winning costumes. 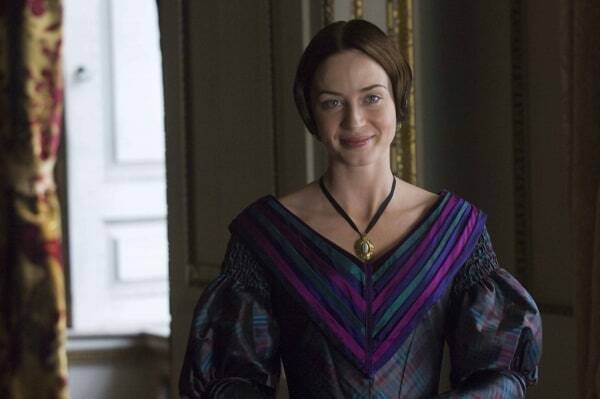 Part two deals with other interesting and noteworthy things going on with Victoria’s costumes as well as a quick glimpse of the costumes of other characters. One of the fun things I noticed for the first time while re-watching the film for this review was that many costumes are worn over again with variations to make them look different. This Tyranny of Style article, based on a talk that Powell gave at the Getty Center, describes how some of the costume elements were reused, “making new costumes by mixing different bodices, skirts and jackets.” This mix-and-match approach really adds to the realism. It’s the sort of thing that real people do with their clothing. It also allows for the inclusion of a lot of fun accessories like capelets and jackets. Victoria’s dark plaid gown is worn in three separate scenes with different accessories and bodices to make it look different. We first catch a glimpse of it when she’s in the carriage during the assassination attempt. 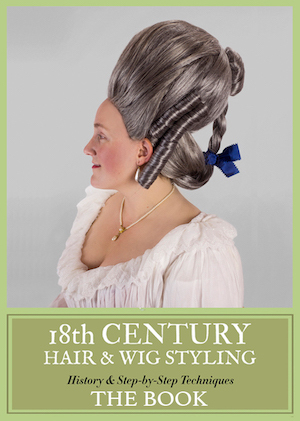 The bodice has purple buttons and it’s worn with a deep green velvet jacket and a jaunty green cravat tied in a bow. Afterwards, she wears it with a little lace collar and sans jacket. Lastly, it’s seen with a totally different bodice that has a low neck and a purple and green bertha. The dark green dress with its unusual circle pattern also has more than one look. Worn in a lot of promotional photos, this is how she wears it in part of the film. 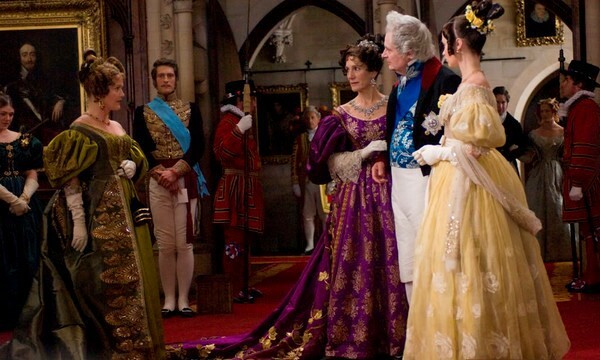 But she also wears it with a green velvet capelet when she is visiting the Dowager Queen. And, based these pictures from The Costumer’s Guide (taken by Lauren at an exhibit) it looks like the skirt is worn with the same deep green velvet jacket that she wears with the plaid gown, as well as with a plaid blouse or dicky that has a big plaid bow at the neck. The Tyranny of Style article also states that “a brilliant tartan plaid dress in the Kensington collection inspired a bright plaid bodice top,” which I’m assuming was this one. The outfit that actually clued me into all this re-wearing was this purplish-blue gown, trimmed with peach. The skirt has a distinct embroidery or brocade pattern in white and peach that is seen with both a day bodice and an evening bodice. The day bodice isn’t seen much, but it has long blue sleeves that are puffed at the elbow, while the evening bodice has short sleeves of the embroidered fabric and is trimmed with peach fringe. Jane Law, who worked on the costumes for the film in an uncredited capacity, has a picture of the day dress on her website as well as other costumes from the movie that she worked on. There were a few other interesting costumes in the movie that are seen with a little less frequency in costume flicks. Victoria has a lot of nightgowns and loungewear that show up in a number of scenes, most importantly when she learns that the king has died and she is now queen, but also a sumptuous dark blue dressing gown and a fluffier one she wears on the morning after her wedding. There are also many shots of her in various states of undress, including wearing lace-trimmed and embroidered chemises when she’s in bed with Albert. 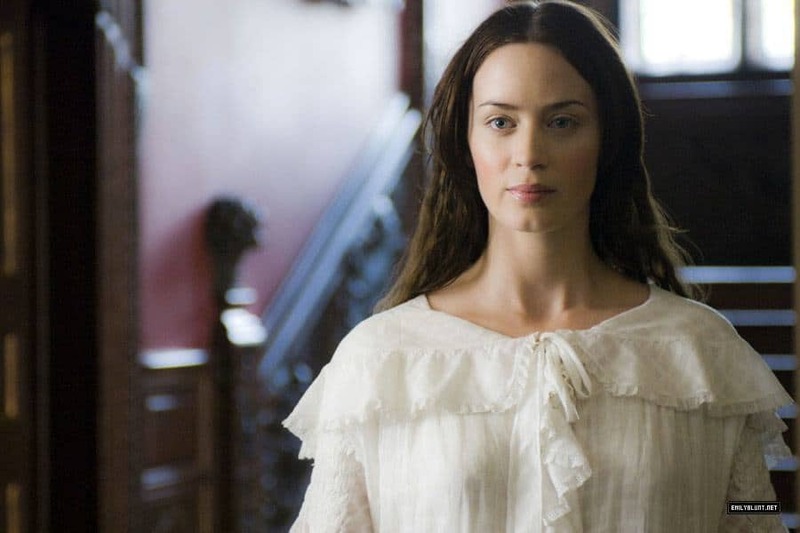 But also a couple of shots of her being dressed by a maid, in which we can see her wearing a corset over her chemise and what looks like a corded or tucked petticoat. 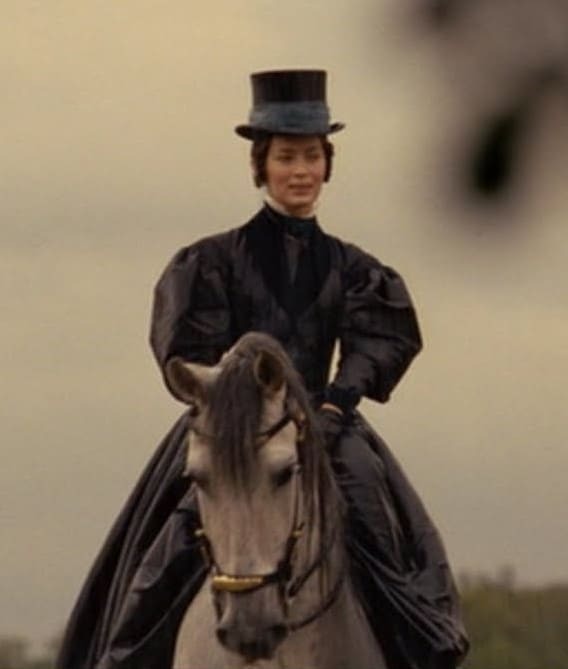 When she is newly married to Albert, the two go riding and she wears this fabulous riding habit with a top hat, shirt, and cravat. Interestingly, it looks to be made of a striped silk rather than wool, which seems rather impractical for riding. 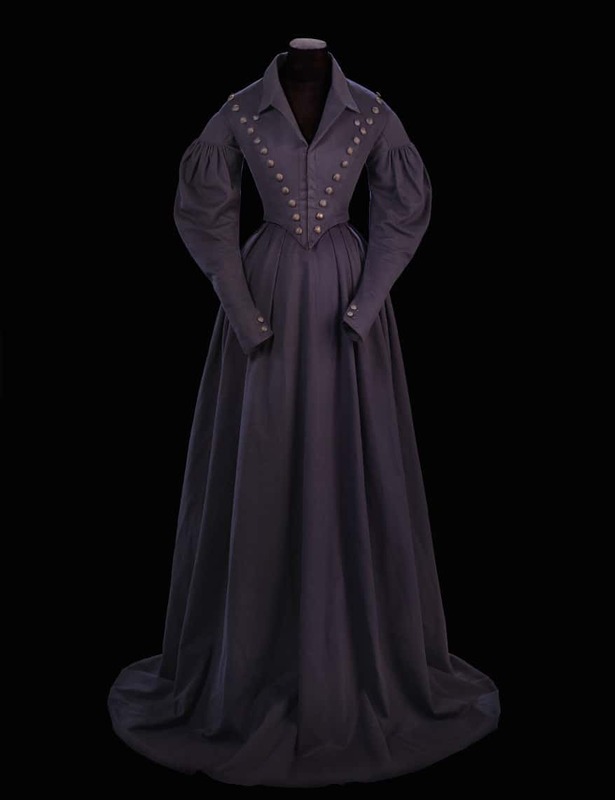 The style is rather reminiscent of this 1837-1840 riding habit in the Glasgow Museum’s collection. One of the great things about this film is the headgear. There is definitely no bobby pin shortage going on here. Victoria’s hair, with the exception of when in bed and one brief day scene when she is still pretty young, is always up. It’s also frequently covered with bonnets. 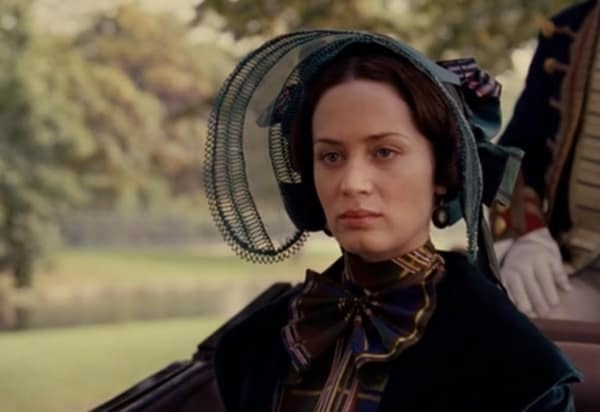 Another thing I noticed while watching this time was that all the bonnets seem to be sheer. This makes sense from a filming perspective, since it allows the light to hit the face and the viewer to better see the actor’s expressions while still making sure that they are appropriately attired for going outside and such. All the sheer bonnets are also really pretty. The straw is in different colours and trimmed with coordinating ribbons and/or flowers. You might not believe it, but there are still a few dresses that Victoria wears that I haven’t shown or talked about, including this dress with gorgeous strawberry fabric that Victoria wears when she proposes to Albert. But I thought I’d end with a couple of shots of the costumes worn by the Duchess of Kent, the Dowager Queen, and others. They’re just too good not to share. What do you love most about The Young Victoria? 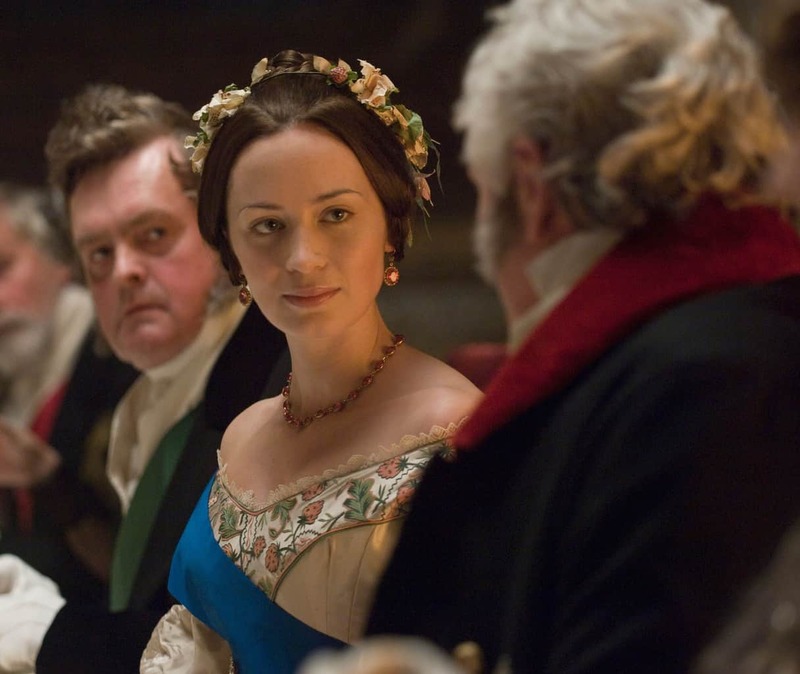 How does it compare to Victoria the TV series? Very interesting review–thank you, and thanks for inclusing all the photos! Can you do a review on costumes of the animated Beauty and the Beast? 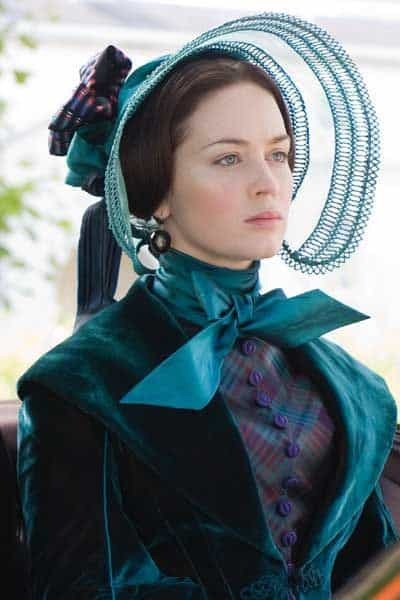 But I wonder if Sabrina had considered Victoria sort of used her bonnets as several things such as providing a ‘wall’ between her and the outside world especially her mother, Duchess Victoire? As a way of appearing ‘all grown up’ against her mother’s constant infantilisng her. And on equal footing with Dowager Queen Adelaide? 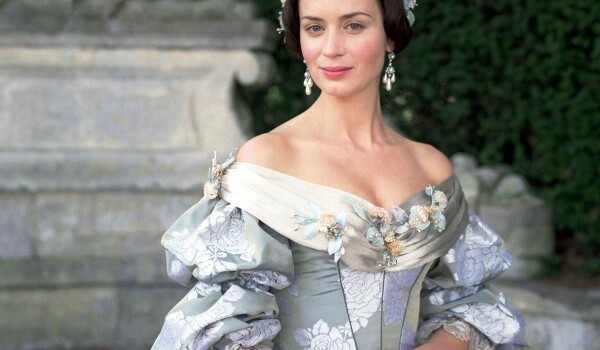 The television show costumes are equally gorgeous and also have meaning. Especially when pregnant, Victoria looks regal and about to go into labour, won’t say more as it might be considered a ‘spoiler’. Past seasons costumes do resemble her coronation robes, her wedding gown and convey her growing maturity and becoming more ‘at home’ with being Queen. The ‘Philippa of Hainault’ Costume Ball tried to be accurate to the painting and I feel it succeeded.